Description: Incomplete Borre-style composite openwork gold lozengiform brooch of the late Anglo-Saxon period, now in four joining pieces, with some distortion and damage to the broken edges and one terminal missing. The front-plate is convex with a sheet back-plate producing a hollow brooch, with slightly concave sides, each corner rounded, with originally four small, circular holes arranged in a central square. 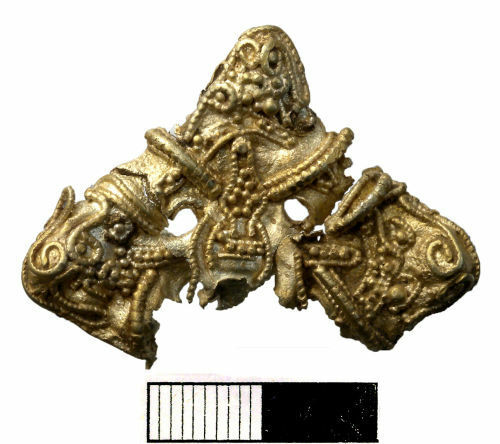 Across one terminal on the reverse is an incomplete rectangular gold strip originally folded in the centre and now broken flush with the reverse of the brooch, probably originally forming a double-thickness catch-plate but possibly an incomplete pin-lug or suspension loop. The front-plate is decorated with separately applied granulation and filigree to form a cross-shaped design with animal head terminals. In the centre is a roundel, now incomplete, formed from two concentric circles of twisted wire (0.5-0.6mm diameter) interwoven with the arms of a cross. The vertical arms of this cross are formed from a line of granules 0.9mm in diameter, surrounded by a U-shaped border of twisted wire 0.5mm in diameter; the surviving horizontal arm is made up of a lozengiform outline in twisted wire (0.5mm in diameter) around multiple tiny granules (0.6-0.8mm in diameter). The ends of the cross overlap C-shaped ribs, formed from thick (1.1mm diameter) beaded wire, now worn flat on top, with thin (0.6mm diameter) twisted wire to either side, which separate the terminals from the centre of the brooch and form the internal angles and sides of a cross-shaped field. A lozengiform border, formed from two lines of 0.6mm diameter twisted wire with tiny (0.6-0.8mm) granules between, follows the edge of the brooch and passes beneath the other elements of the design; the angles of this lozenge are in the centre of the animal-head foreheads. The features of the animal-head terminals are formed from slender (0.5mm) twisted wire with opposed spiralling terminals indicating a mouth and nostrils, and eyes formed from large granules or pellets (1.0-1.5mm in diameter) surrounded by a drop-shape of twisted or finely obliquely beaded 0.5mm diameter wire. Further granules, many of which are now missing, are set between these elements. All of the twisted wires are slender in dimensions, c. 0.5-0.6mm in diameter, and appear to be made in the same way, either by twisting a square rod to form helical grooves or by holding a swage at an angle to form oblique beads. Dimensions: Length 39mm, weight 5.5g. Discussion and Date: Although the material and method of manufacture are quite different, the design is extremely similar to that found on 10th-century cast copper-alloy lozengiform brooches of Scandinavian origin (see examples published in Kershaw, 2010, vol.2, 8-19, particularly no.15) many of which include cast beading on the arms of the central cross. The lozengiform design with animal-head terminals is also repeated on mounts and pendants (Kershaw, 2010, vol.1, 102), including LIN-919D84 and SWYOR-FEEF24, both from Lincolnshire. This strongly suggests a 10th-century date and Scandinavian origin for this example, although a Late Saxon parallel for the form has been noted in a mount from Bawburgh, Norfolk, by S. Ashley (p. 135, fig. 3a in J. Bradley and M. Gaimster eds., 2002, 'Medieval Britain and Ireland in 2001', Medieval Archaeology, 46, 125-264). 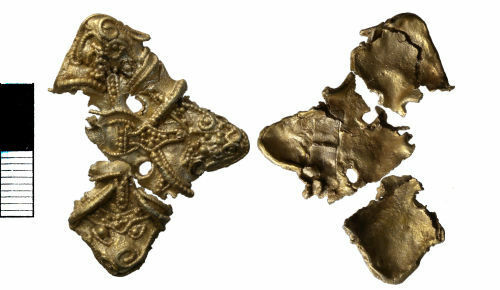 The method of creating a catch-plate, pin lug or loop by soldering a piece of sheet metal with a raised section is paralleled by examples on more elaborate gold and silver disc brooches, which are also decorated with filigree, granulation and animal heads, from Denmark (Graham-Campbell, 1980, 223, no.137 and 142). Thanks are due to James Graham-Campbell for his kind help with the interpretation of this object, which he has recently published in detail (Graham-Campbell 2017). As this object is made of more than 10% precious metal and is over 300 years old, it constitutes potential Treasure under the Treasure Act 1996.